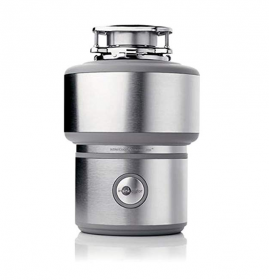 If you planning to buy a food garbage disposal or the old food garbage disposal need to be replaced. Then, you will collect some information about the food garbage disposal, compare and choose the best food garbage disposal for you and your family. We’ve been working hard to collect food garbage disposal for sale online, see buyer reviews and plumbers’ blogs, and find out as much as possible about the best food garbage disposal. Based on these opinions, search for the most suitable products and show them here. If this helps you buy a food garbage disposal, please leave a comment and let us know how we need to improve our work. That will be much appreciated. 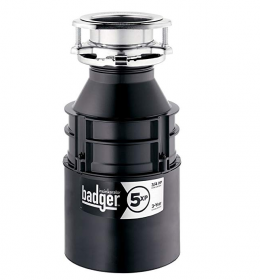 If you want to get a top brand like InSinkErator at a reasonable price, then Badger 5 is for you. Waste treatment enthusiasts are no strangers to Insinkerator Badger 5. The device is simple in design and durable in construction. The first important part: the motor and the choice of the motor are moderate. The Insinkerator Badger 5 has a 1⁄2 HPDura-Drive® induction motor with a speed of 1725 rpm. In addition to bones, the machine can grind anything, vegetables, eggshells, peels, roots and skins; and it won’t take long (usually 5-10 minutes after dinner). The second important part: the grinding chamber. There is a spacious 26 ounce grinding chamber that provides a lot of space. The entire unit, including the grinding system, is made of durable galvanized steel. Measuring 7 x 7 x 13 inches and 14.1 pounds, this compact unit is durable and reliable. The Badger 5 uses a single-stage grinding technology, including the GrindShear ring. This ring can be used to grind food and liquefy them. Food waste that has been liquefied is easier and safer to break down your sewage system and landfill. 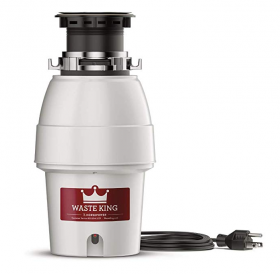 Waste King L-8000 Garbage Disposal is impressive with its powerful features. With a small footprint and a weight of only 14.7 lbs, the Legend 8000 measures just 9 x 9 x 16.2 inches and has powerful features. Although most high-end waste disposals are equipped with half-horsepower motors, this unit has double the power. The impressive 1.0 hp ‘Vortex’ permanent magnet motor is energy efficient and has a speed of 2,800 rpm. This process can grind almost anything between the motor and the stainless steel grinding parts. The grinding chamber is made of glass-filled nylon and does not rust at all, so you never have to worry about corrosion. They also isolate stainless steel abrasive parts to reduce the noise generated by the processing system. We also like the ease of use provided by this device. It has a continuous feed system that allows you to add food while the motor is running. It is equipped with a heavy-duty cast stainless steel anti-blocking rotary impeller, which means it won’t be blocked and will not easily produce odor. If you are concerned about possible splashes caused by strong grinding, the unit is equipped with a detachable splash guard for easy cleaning. There are a lot of people in the family, do you need a processor that can withstand a lot of food waste? This expensive InSinkErator Pro is worth investing instead of smaller, lower power garbage disposal. It has a 1.1 hp, 1,725 rpm motor and a 40 ounce stainless steel grinding chamber that handles large amounts of food waste at the same time. The InSinkErator has three levels of MultiGrind technology, which means it can break down large chunks of food. Unlike many of the cheaper ones, it has an automatic reverse and jam sensor that removes stuck food. SoundSeal technology including Quiet Collar Sink Baffle reduces annoying vibrations and noise, and the user confirms that this is a very quiet treatment, especially considering its power. They also say it is easy to install, but please note that the power cord must be purchased separately. 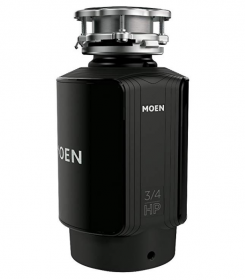 Moen GX75C GX Series 3/4 hp Garbage Disposal. Powerful handling: 3/4 hp eddy current) The motor has a powerful grinding capability that eliminates hard kitchen waste. Easy to install, suitable for Moen and most existing 3-bolt mounting assemblies. High Speed: 2700 eddy current) permanent magnet motor designed to reduce clogging and easy to install: Pre-installed power cord saves installation steps and money compared to other models that must be purchased separately. Quiet waste disposer: The sound enclosure ™ is designed to provide sound and sound insulation. 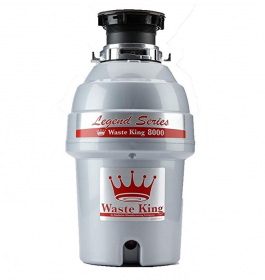 The Waste King Legend L-2600 has many of the same features at a reasonable price. Waste King is a company that specializes in waste disposal parts. Although the L-2600 is slightly less powerful than the L-8000 brothers, it is still a great choice for your home. To further prevent corrosion, the grinding chamber is made of glass filled nylon. In addition to this high quality construction, the grinding system also includes a stainless steel rotating impeller to reduce clogging. The other impressive feature of the L-2600 is its “continuous feed” capability. This means you can add more food waste without turning off your device. Once running, you can add as much waste as you need. The abrasive components are insulated to reduce the noise generated by the processing unit. The unit is surrounded by an easy-to-remove splash guard that keeps it clean and easy to clean. The L-2600 unit has a quick and easy installation system that includes all the necessary hardware in the box and does not require installation. In the box, you can also find a 36-inch power cord and the previously described removable splash guard. Noise pollution is one of the risk factors for human health. The noise level must be considered when planning to purchase equipment. Everyone’s budget is different, not that the noise is less. If you like quiet and have enough money, Insinkerator is the best choice. But if your budget is limited and the sound insulation requirements are not too high, then the waste king L-8000 or Badger 5 is very suitable. But if you want to minimize the noise level, you may want to consider other factors. There is a sink. Because it is directly connected to the waste disposer, the sink is likely to be affected and resonate with the vibration of the machine. 2.how much residual food do you have to deal with? If you have a lot of food waste to be processed, then there is nothing wrong with choosing Insinkerator PRO1100XL. It has a large capacity and can swallow the food waste you need to process at one time, without waiting for you to stand there. Otherwise choose Waste King. If the motor is strong, the finer the grinding, the less likely it is to block the drain. As we all know, processors have different scales, the bigger the machine, the more powerful and the more advanced. However, only one large box can accommodate large motors. So you have to consider whether your cabinet can be loaded.